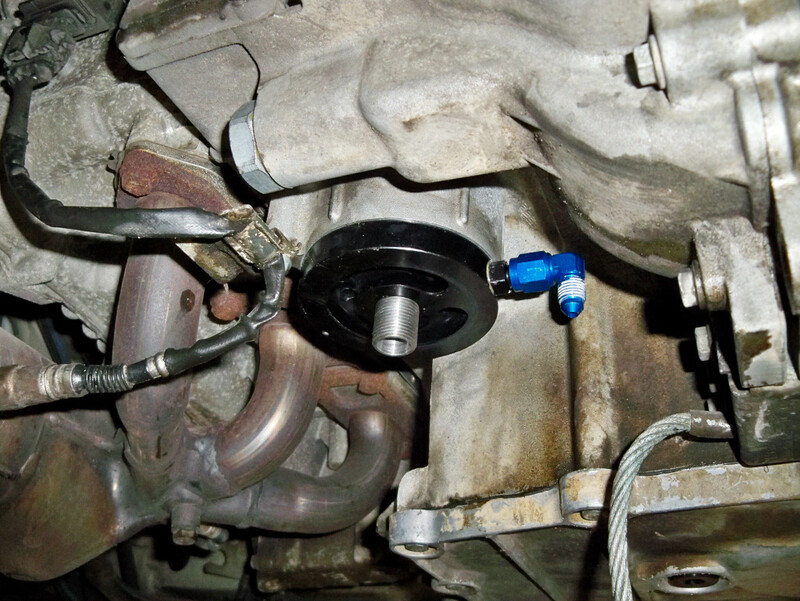 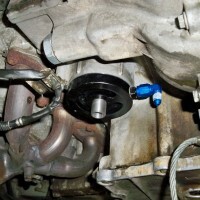 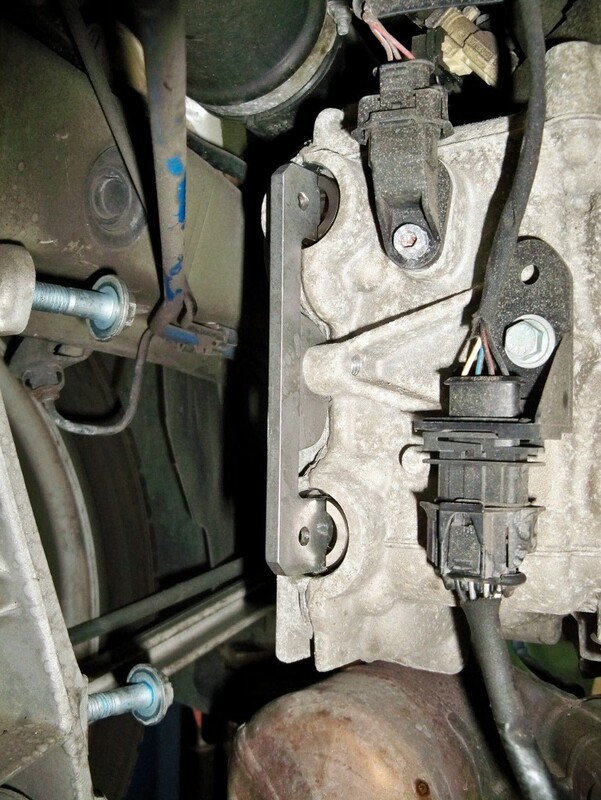 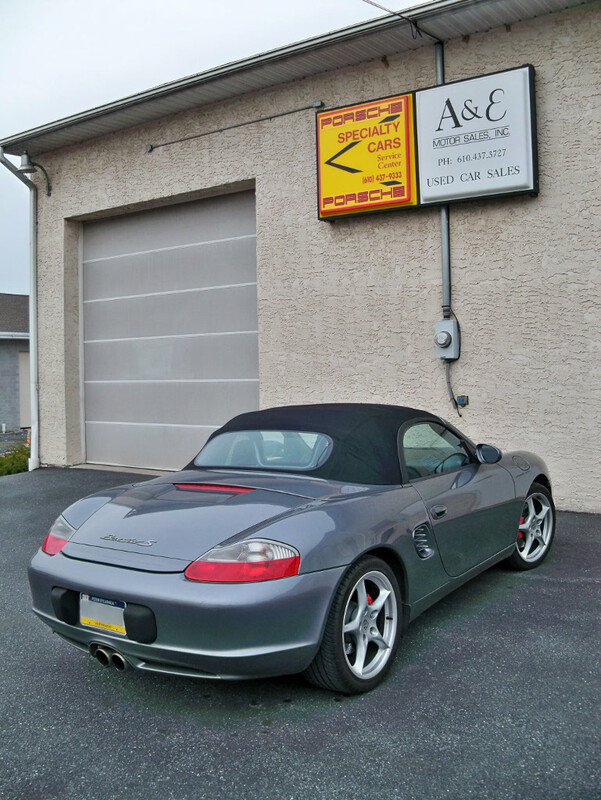 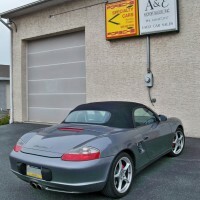 2004 M96 Boxster S IMS Bearing LN Solution Installation » Specialty Cars Service Center, Inc. 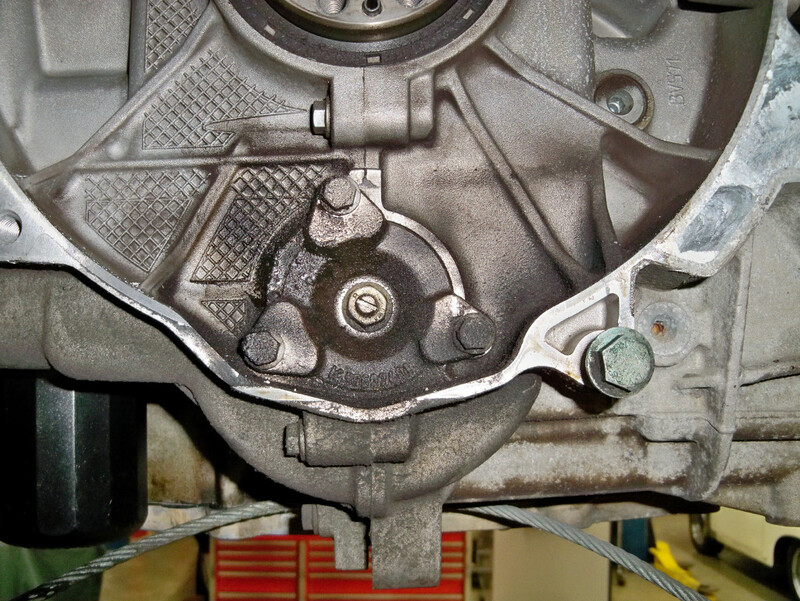 This project involves replacing the original IMS bearing with LN Engineering’s IMS Bearing Solution on a 2004 Boxster S.
It is very important to perform careful inspection for metal flake and debris in the oil at every oil change (that could lead to the IMS bearing already beginning to come apart). 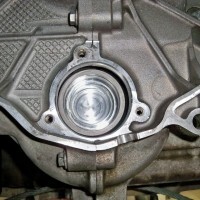 Here, we are inspecting the bottom of the oil filter housing for debris. 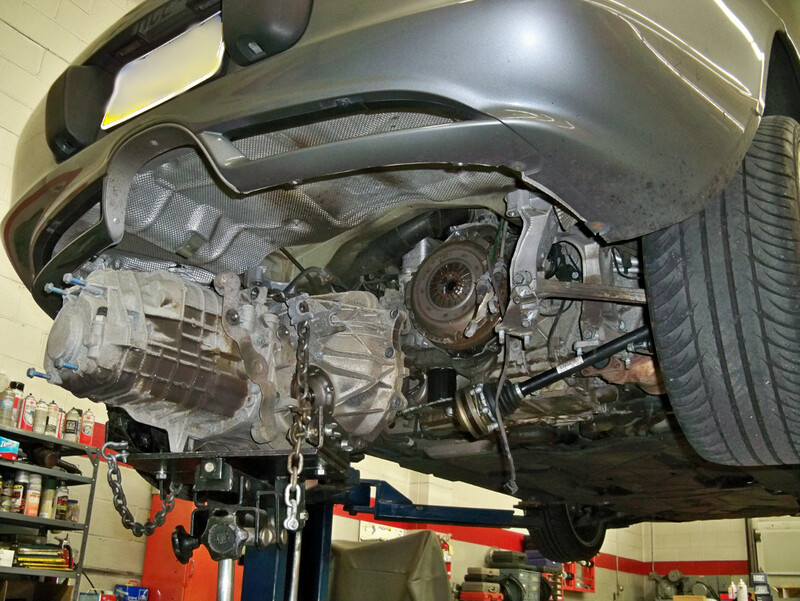 Please note: if there is too much debris, this could be a sign that your engine is already compromised and will need a complete rebuild. 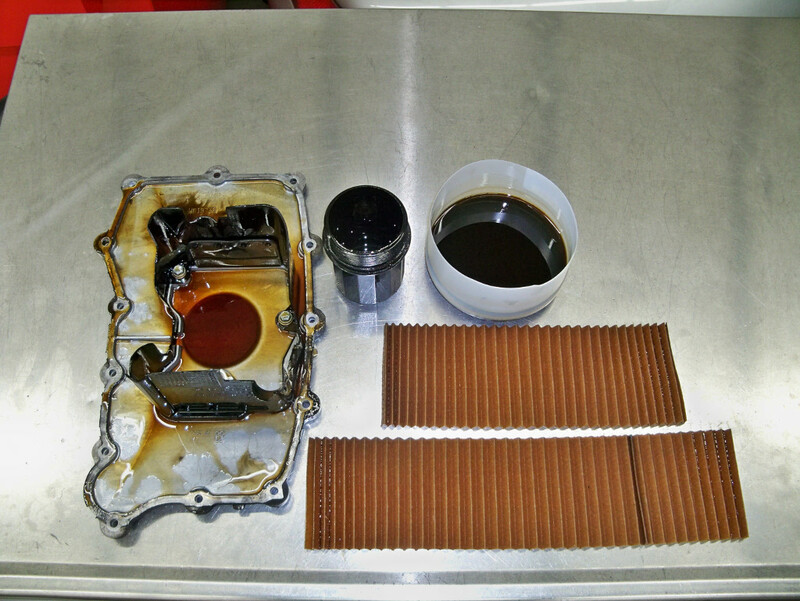 After inspecting the filter housing, we cut the oil filter open to check for any debris that may have been caught in the filter. 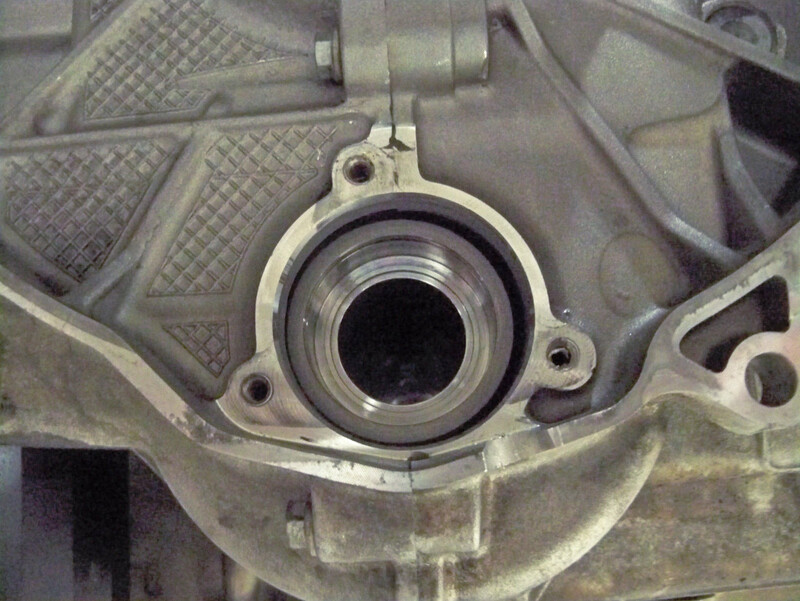 Then, we remove the oil sump plate to further inspect for debris leading to IMS bearing failure. 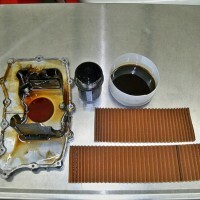 The engine oil sump plate removed. 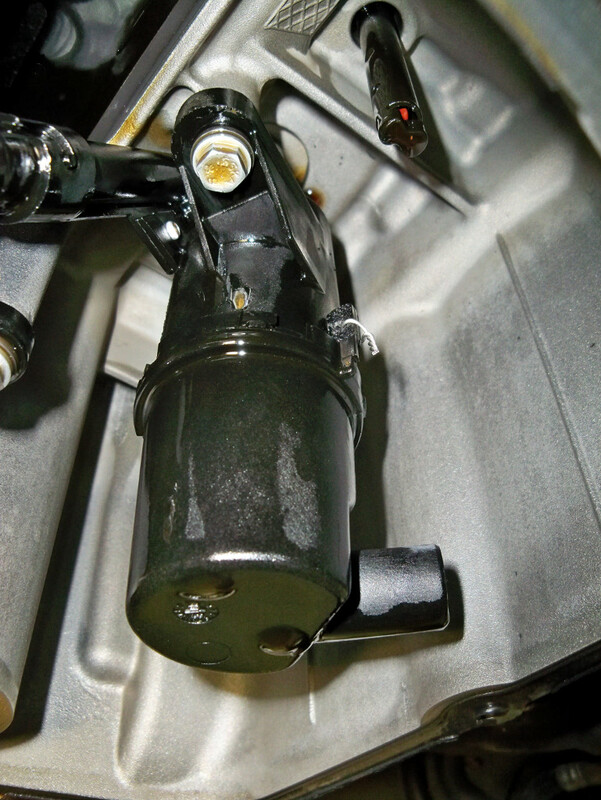 We look carefully at the oil pump pickup screen for debris. 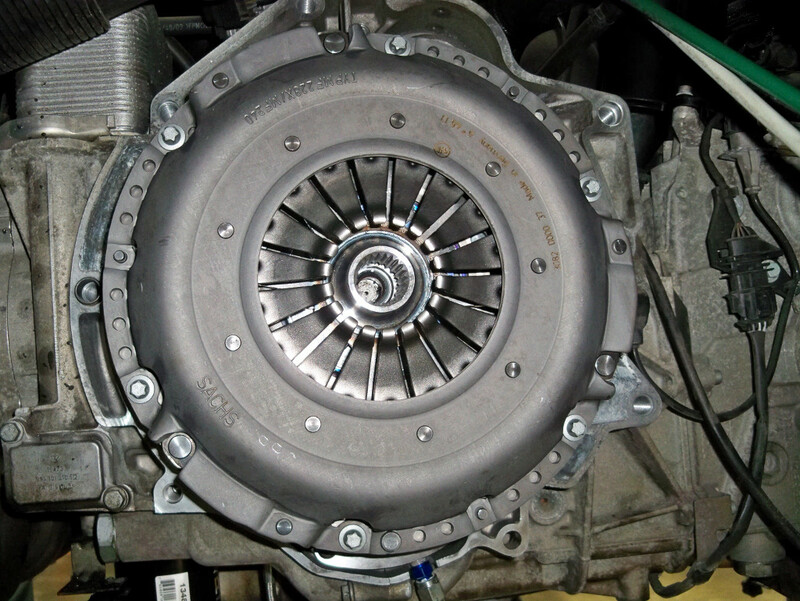 Early swirl pots are two piece and can separate under hard driving. 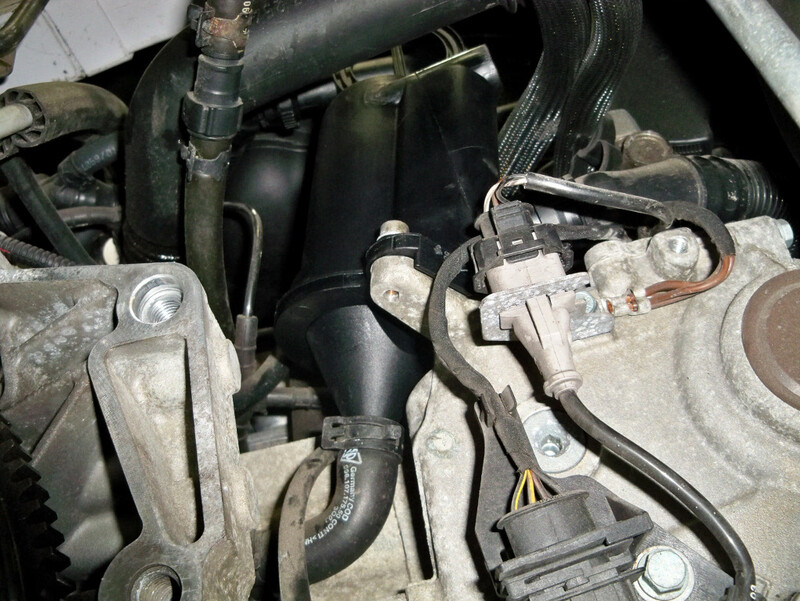 To prevent separation, the plastic tabs are safety wired together to avoid engine failure from failed swirl pots and foamy engine oil. 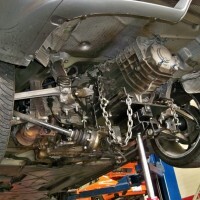 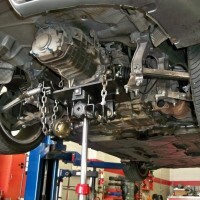 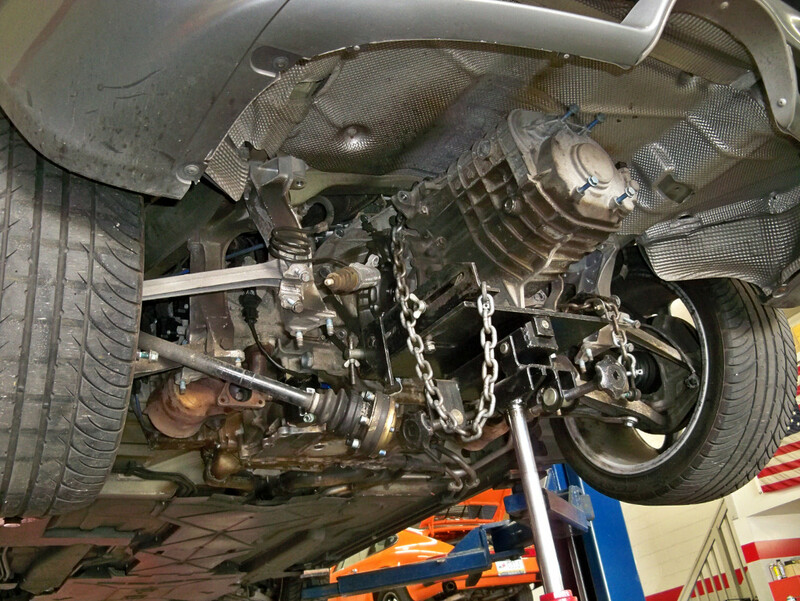 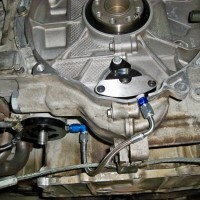 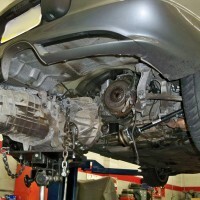 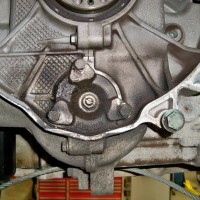 The camshafts must be locked into place before beginning the procedure. 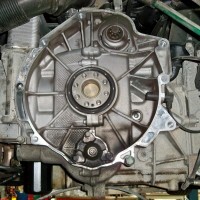 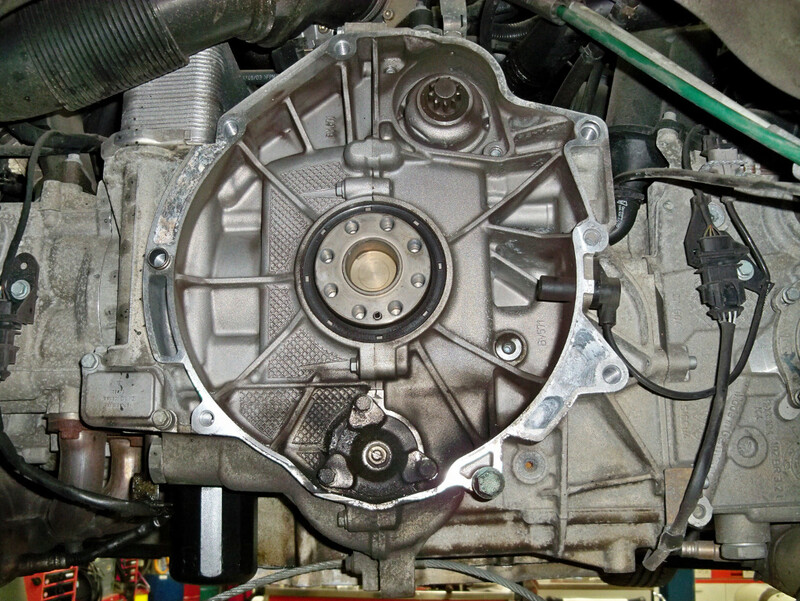 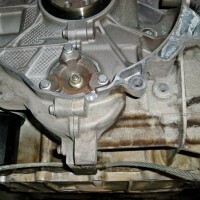 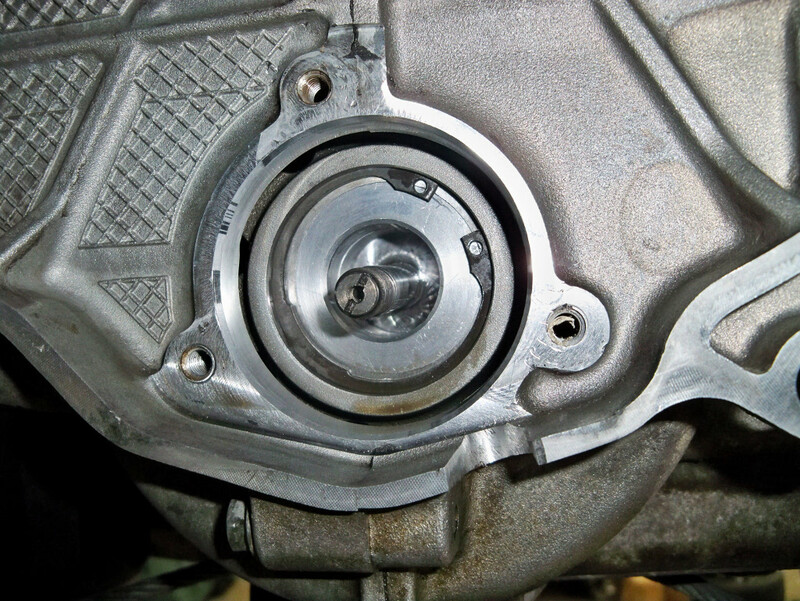 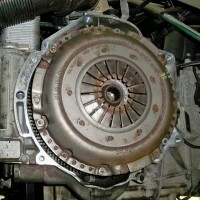 Removal of the transmission marks the beginning of the procedure. 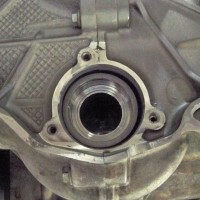 A look at the rear main seal and the IMS bearing flange. 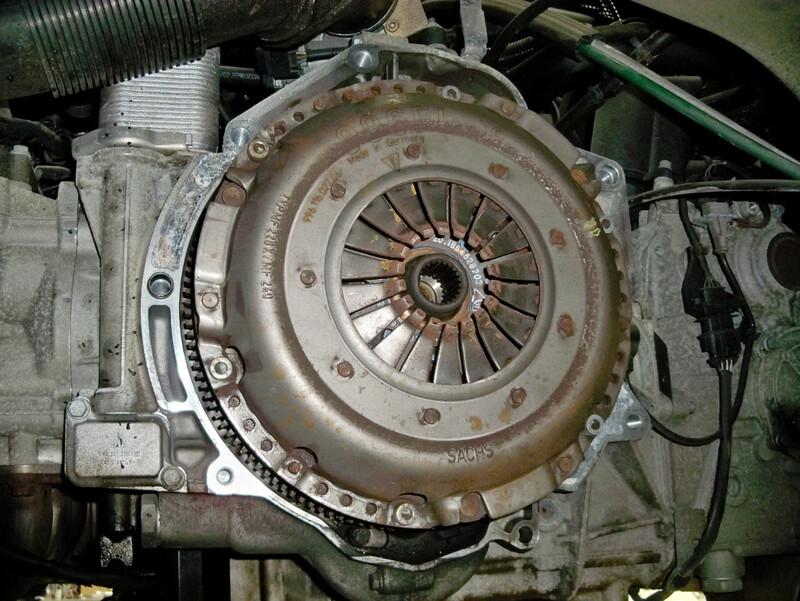 Removal of the rear main seal. 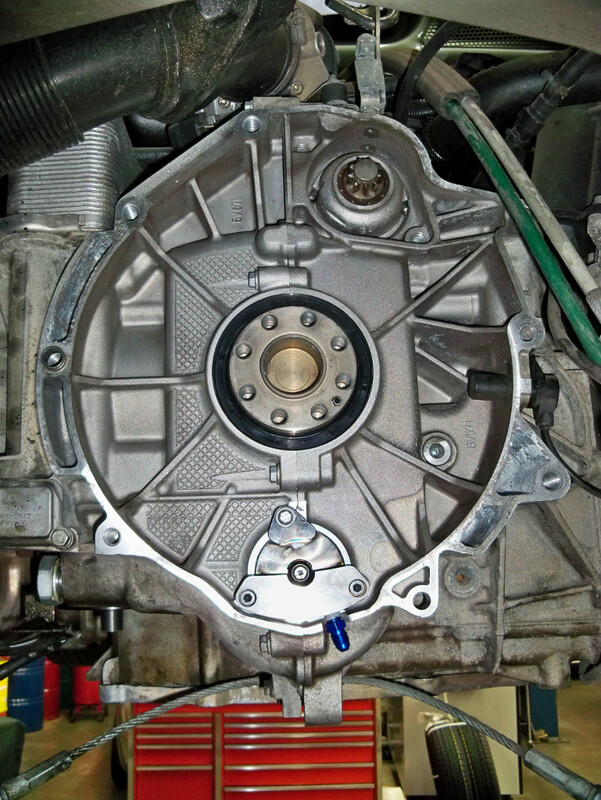 This will be replaced with a new seal. 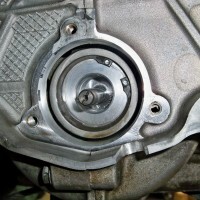 A small notch is cut into the crankcase (for the pressurized oil line that feeds the IMS Solution). 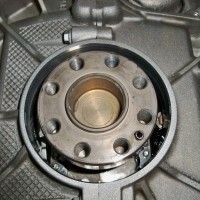 Then, the area is cleaned completely before the IMS flange can be removed. 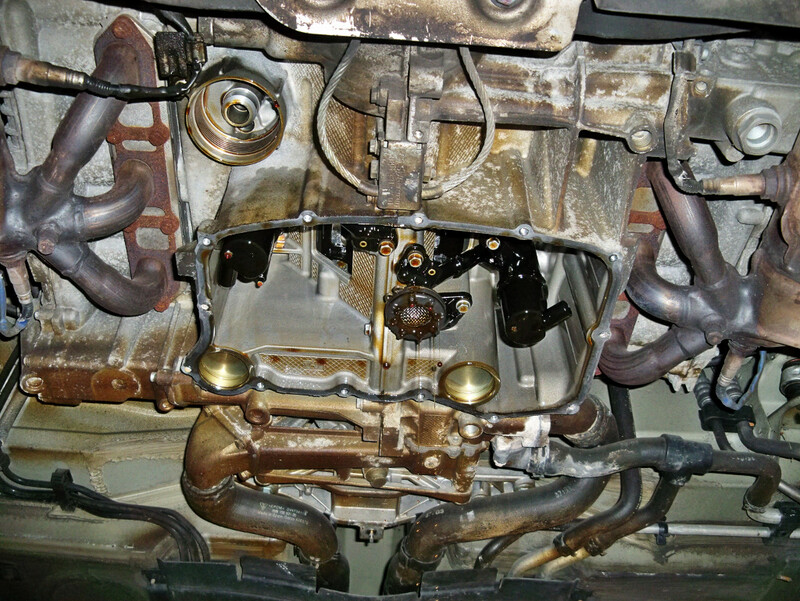 A clean working space will ensure that no dirt or debris enters the engine. 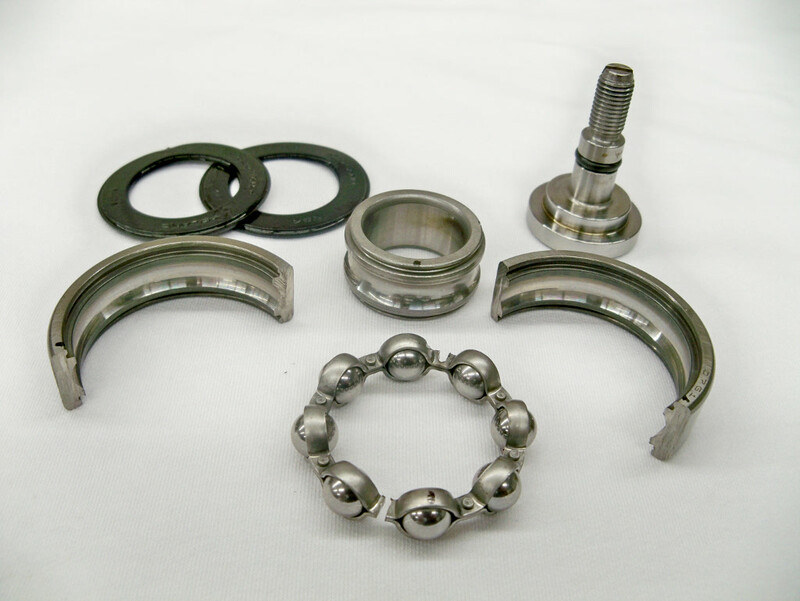 We take apart the original IMS bearing and carefully inspect the ball bearings and races to confirm that the bearing did not come apart enough to compromise the engine. 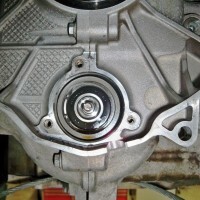 This will ensure that the engine has not been affected and that the new IMS bearing will not be damaged by old bearing debris that could be left behind from a badly worn bearing. 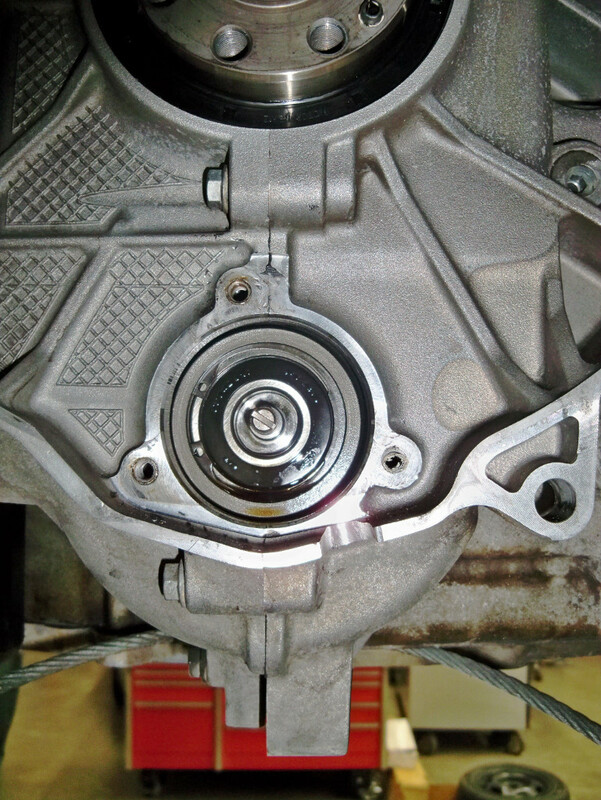 After confirming that the engine has not been compromised and it is a good candidate for a new bearing, we then continue with the procedure by cleaning the intermediate shaft bearing seating surface before installation of the new LN Engineering IMS bearing Solution. 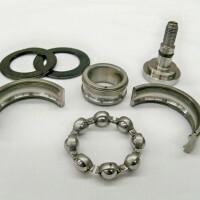 Install the IMS Solution bearing into the intermediate shaft. 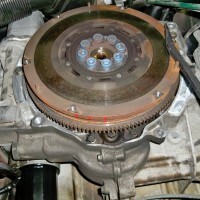 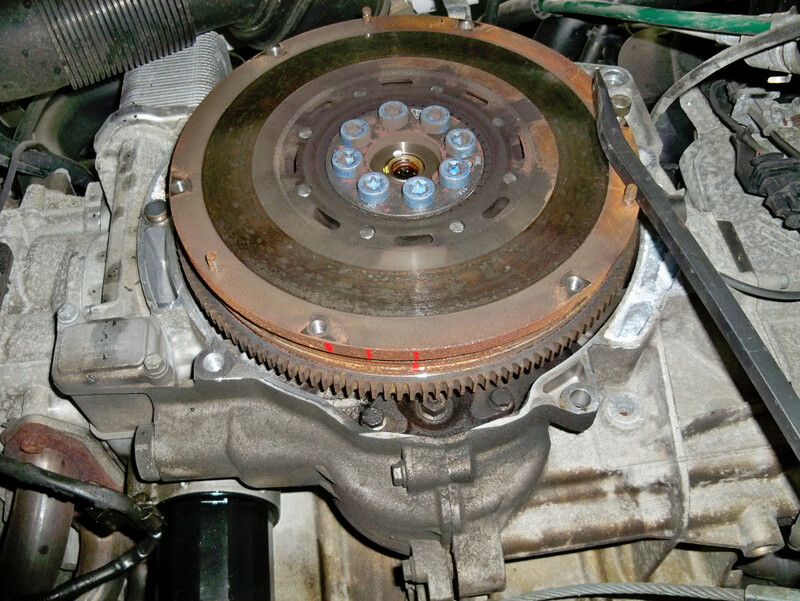 Then a protective shim is installed over the bearing, and the snap ring is installed after. 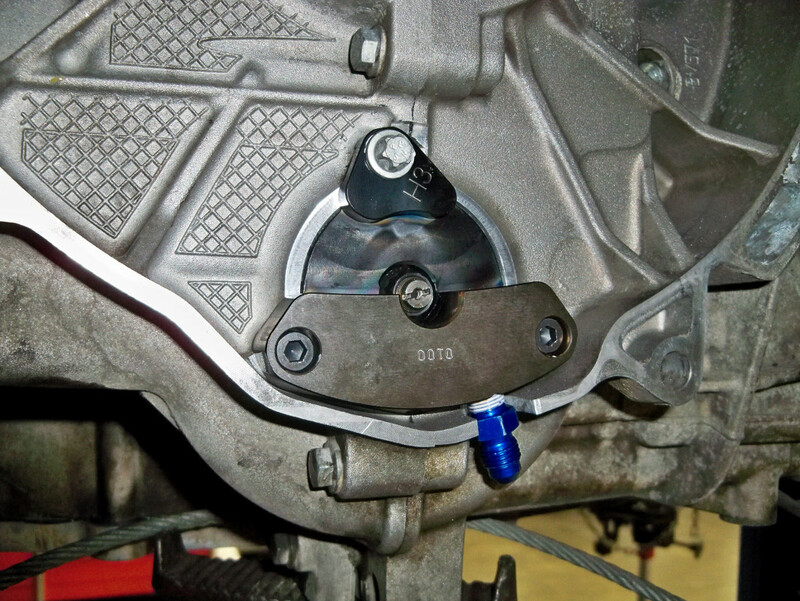 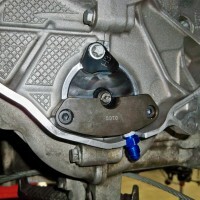 The oil fitting is then installed into the IMS Solution bearing flange, which also is then installed. 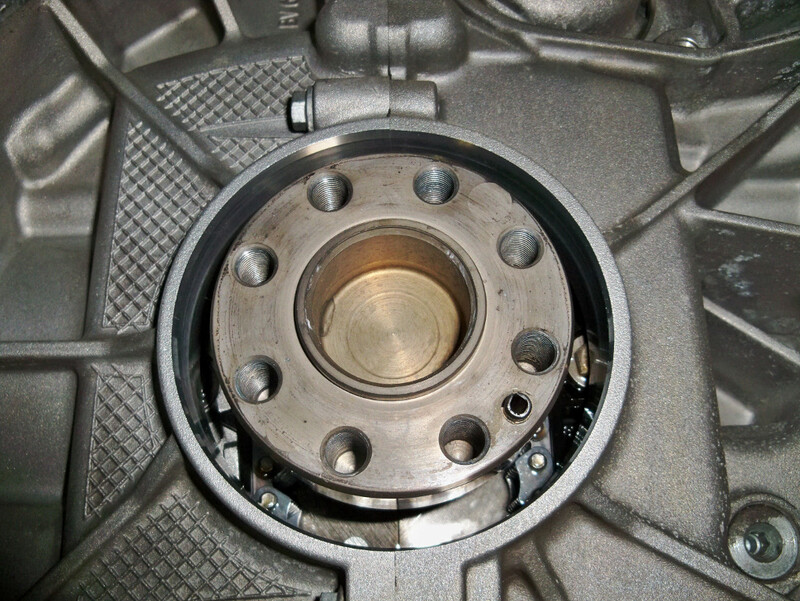 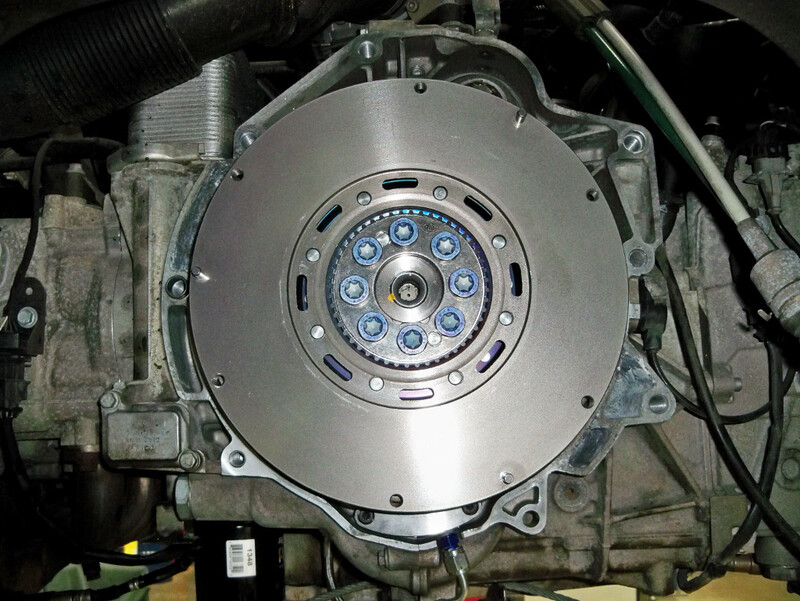 A look at the new rear main seal and IMS Solution bearing flange. 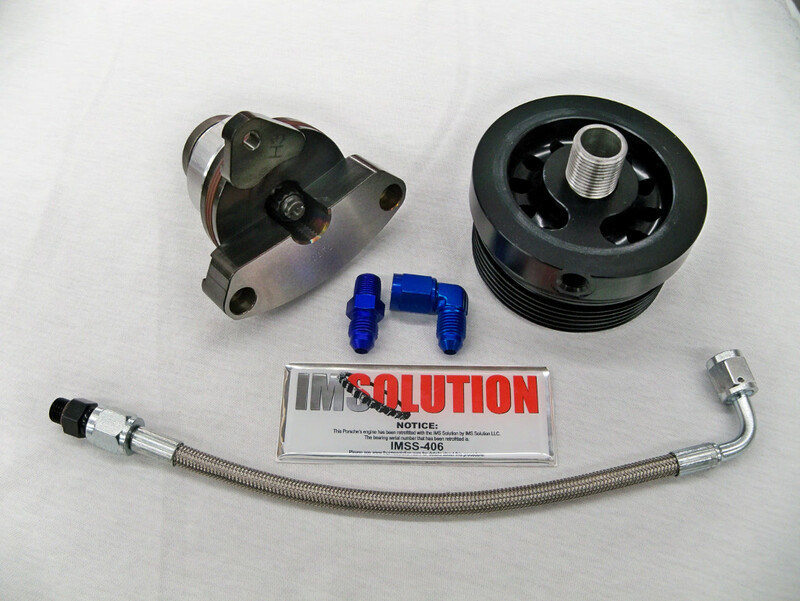 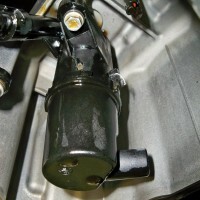 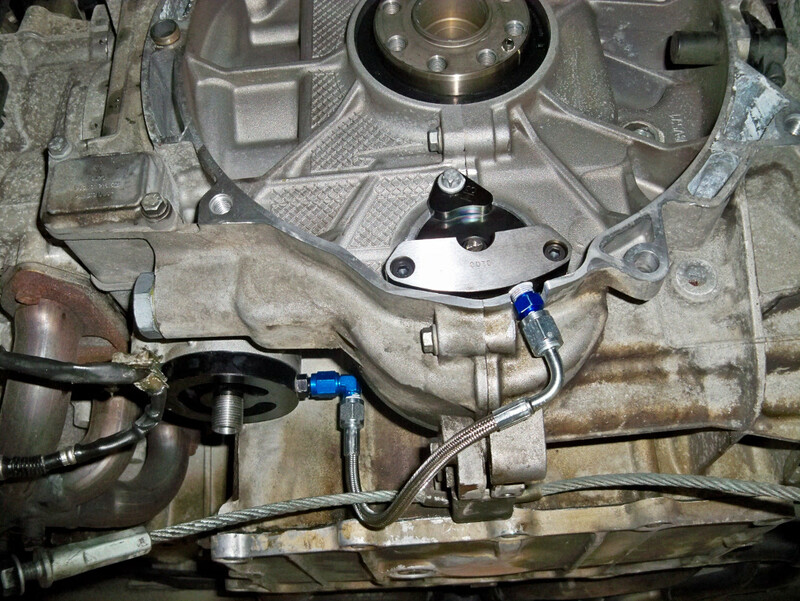 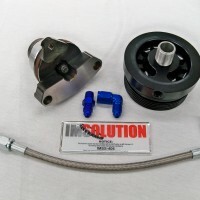 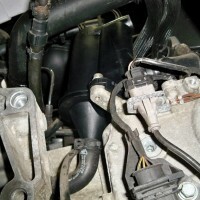 The IMS Solution oil filter adapter is then installed onto the engine along with the other oil fitting. 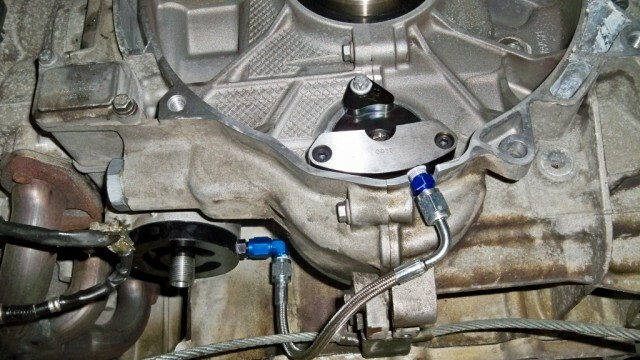 The supplied steel braided hose is installed from the oil filter adapter to the IMS Solution flange. 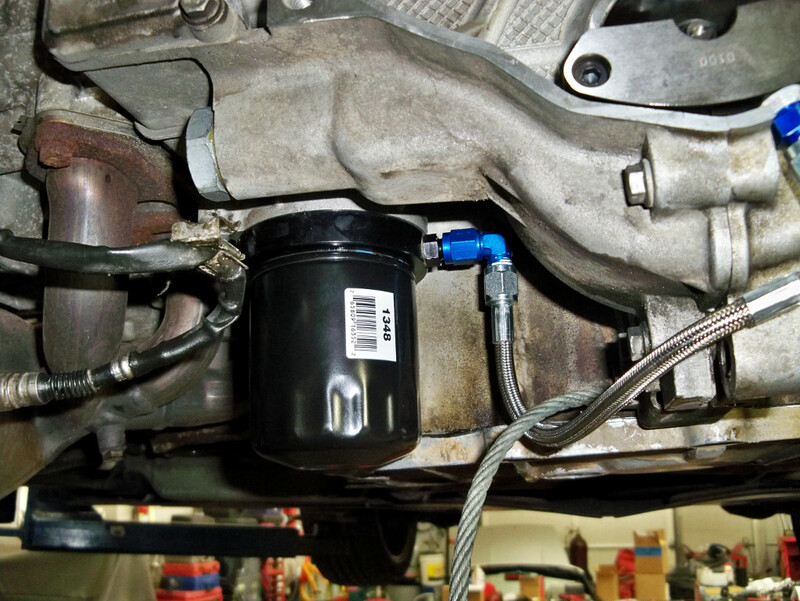 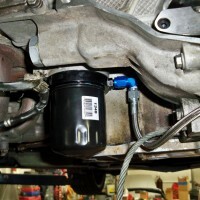 Spin-on oil filter installed, which is pre-filled with clean engine oil. 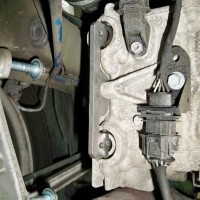 The AOS, which is another component that commonly fails, was also replaced after test results showed it was out of specifications. 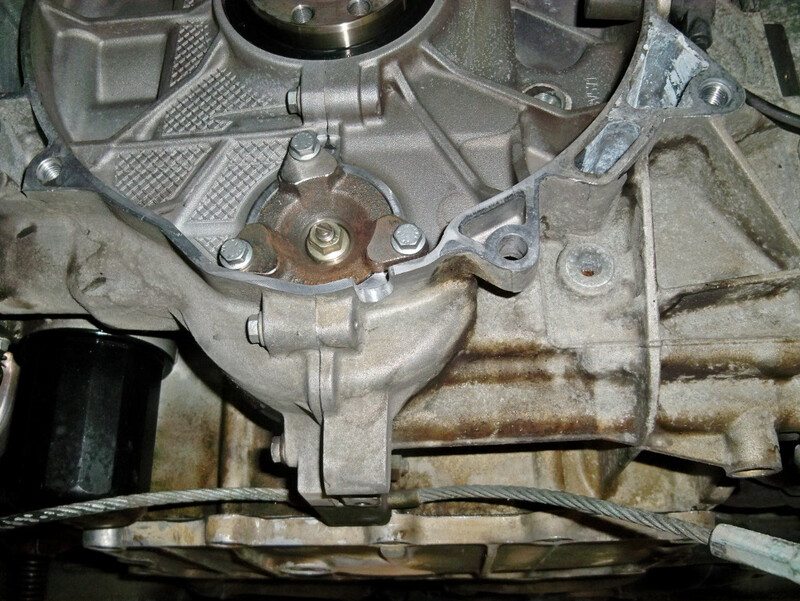 A failed AOS can lead to severe damage in only a matter of minutes. 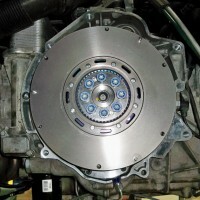 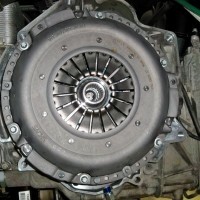 New dual mass flywheel installed. 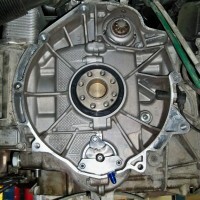 The transmission is ready to be reinstalled in the car. 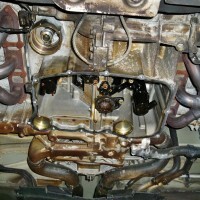 From here, oil pressure will be built and the engine will be started. 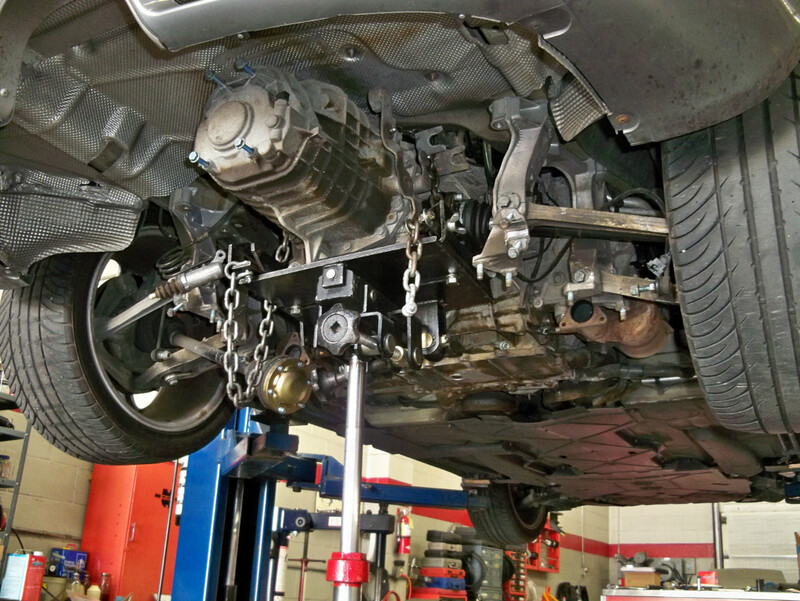 We recommend bringing the car back for a follow-up oil change in 100-150 miles. 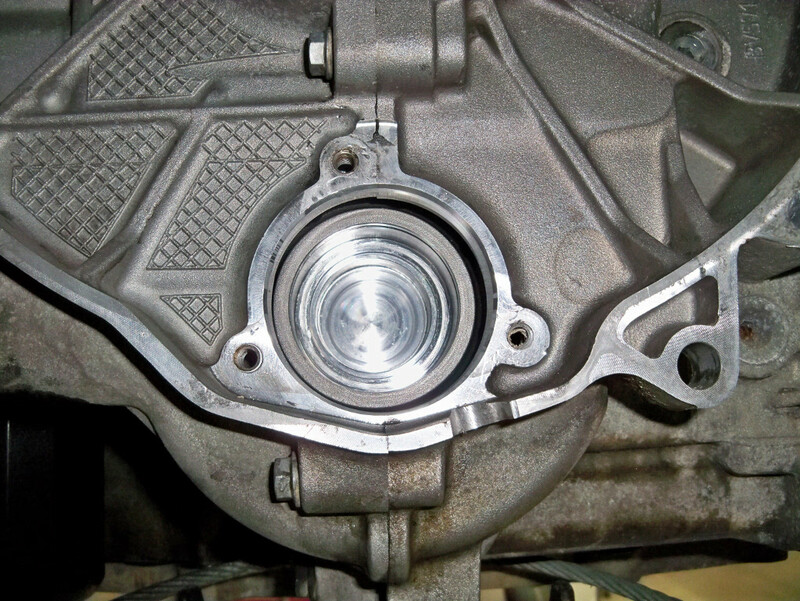 From there, the filter and sump will be assessed for additional metal flake or debris that may have been left behind from the original IMS bearing.